Jack Kent Cooke (October 25, 1912 – April 6, 1997) was a Canadian-American entrepreneur and former owner of the Washington Redskins (NFL), the Los Angeles Lakers (NBA), the Los Angeles Kings (NHL), and the Los Angeles Wolves (United Soccer Association). He also developed The Forum in Inglewood, California and FedExField near Landover, Maryland. Cooke had an exceptional gift for evaluating leadership and an ability to teach, giving Jerry West, Joe Gibbs, and Sparky Anderson their first head coaching/managerial positions. All three became Hall of Fame executives, with West winning seven championships as an executive (six with the Lakers, and another with the Golden State Warriors). Gibbs led Cooke's Washington Redskins to three Super Bowls and later won four NASCAR Sprint Cup Series titles, while Anderson won three World Series championships. Born in Hamilton, Ontario, Cooke moved with his family to The Beaches area of Toronto in 1921, where he attended Malvern Collegiate Institute. At age 14, Cooke got a job selling encyclopedias door to door. At the end of his first day, he took home over $20 to his mother, and is reported as later saying, "I think that was the proudest moment of my life." He later became a runner on the floor of the Toronto Stock Exchange. He was selling soap in Northern Ontario for Colgate-Palmolive in 1936 when he met Roy Thomson, who hired Cooke to run radio station CJCS in Stratford, Ontario. The two became partners in 1941, buying radio stations and newspapers in Ontario and Quebec. With the financial backing of J. P. Bickell, Cooke purchased CKCL in 1945, changing the call letters to CKEY. He also continued to work with Thomson, and the two acquired the Canadian edition of Liberty magazine in 1948, naming it New Liberty. The following year, Thomson sold his half of the magazine to Cooke. Jack Kent Cooke (right) swaps hats with Joe Becker, who managed the Maple Leafs in 1951–52. In 1951, Cooke ventured into sports, acquiring the minor league Toronto Maple Leafs baseball club. He transformed the games from straight athletic contests into complete entertainment packages, with a long list of special promotions and celebrity appearances. With his focus on entertainment, Cooke was compared to St. Louis Browns owner Bill Veeck. Five months after becoming owner, Cooke presented a 48-page booklet to all the teams in the league, outlining his promotional strategies. He was named minor league executive of the year by The Sporting News in 1952. That same year, Cooke purchased Consolidated Press, publisher of Saturday Night magazine. He made an unsuccessful bid for The Globe and Mail newspaper in 1955. While owning the Maple Leafs baseball team, Cooke set his sights on bringing Major League Baseball to Toronto. 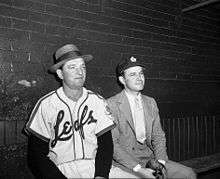 He tried to purchase the St. Louis Browns, Philadelphia Athletics, and Detroit Tigers when they came up for sale, and in 1959 he became one of the founding team owners in the Continental League, a proposed third major league for professional baseball. The league disbanded a year later without ever staging a game. Cooke still hoped to get an American League expansion team in Toronto, but the city's lack of a major league venue became an impasse. Cooke would sell the Maple Leafs in 1964 and was inducted into the Canadian Baseball Hall of Fame in 1985. In 1960, Cooke lost a bid to obtain a license for the first privately owned TV station in Toronto. There had been nine bids in a highly competitive process, and the license was awarded to a consortium of Aldred-Rogers Broadcasting and the Telegram Corporation, which launched CFTO-TV. Within weeks of being turned down for the Toronto TV license, Cooke applied for U.S. citizenship. With the support of Francis E. Walter, Cooke quickly became a citizen when both houses of Congress and President Dwight D. Eisenhower approved a waiver of the usual five-year waiting period. He sold CKEY at the end of 1960 and Consolidated Press in 1961. At the time, Canada and the U.S. both had laws prohibiting foreign control of radio and TV stations. Cooke had entered the U.S. broadcasting industry in August 1959 by acquiring Pasadena, California radio station KRLA 1110 through his brother, Donald Cooke, a U.S. citizen. Cooke formed American Cablevision in the 1960s and acquired several cable television companies. He acquired majority ownership of TelePrompTer cable TV and sold it in the late 1970s for $646 million. In 1980, he bought the Chrysler Building in New York City, one of the world's most renowned skyscrapers. In 1985, Cooke bought the Los Angeles Daily News for $176 million. A year later, he acquired another cable TV company. The cable systems were sold in 1989. "I was never into Cooke-watching as much as I was into watching his teams, and the people he hired to run them. You didn't have to be close to Cooke to make this case: He was the best owner in the history of sports. Not pro football, all of sports." While he was owner of the Redskins, Cooke's team won three Super Bowls under head coach Joe Gibbs in 1982, 1987, and 1991, the franchise's first championships since the 1940s. In his will, Cooke left the team and stadium to his foundation with instructions to sell it. Cooke's son, John Kent Cooke, tried to put in a competitive bid to keep the team in the family, but it instead went to local businessman Daniel Snyder and his associates for a record-setting $800 million. In September 1965, Cooke purchased the Los Angeles Lakers for $5 million from Bob Short. Under Cooke's ownership the Lakers moved from the Los Angeles Memorial Sports Arena to The Forum and changed their colors from Royal and Light Blue to the current Purple (which he referred to as "Forum Blue") and Gold. The Lakers during Cooke's ownership reached 7 NBA Finals and won the 1972 NBA Finals. As a Canadian, Cooke particularly enjoyed ice hockey, and he was determined to bring the National Hockey League (NHL) to Los Angeles. In 1966, the NHL announced it intended to sell six new franchises, and Cooke prepared a bid. The Los Angeles Memorial Coliseum Commission, which operated the Sports Arena, supported a competing bid headed by Los Angeles Rams owner Dan Reeves, and advised Cooke that if he won the franchise he would not be allowed to use that facility. In response, Cooke threatened to build a new arena in the Los Angeles suburb of Inglewood. Nearly 30 years later Cooke told the Los Angeles Times sportswriter Steve Springer that he recalled "one official representing the commission laughing at him" (Springer's words) when Cooke warned he would build in Inglewood. Cooke won the franchise, and paid $2 million for the new Los Angeles NHL club, which he called the "Kings." Springer: "Cooke went to Inglewood and built the Forum. Good-bye, Lakers. Good-bye, Kings." The Kings played their first game on October 14, 1967—at the Long Beach Arena, while construction was being completed at Cooke's new arena. Cooke claimed The Forum would be "the most beautiful arena in the world." It opened December 30, 1967, to rave reviews. Cooke was soon calling it "The Fabulous Forum." The Kings struggled both on the ice and at the gate, however. Cooke had been told that there were more than three hundred thousand former Canadians living within a three-hour drive of Los Angeles, and remarked, "Now I know why they left Canada: They hate hockey!" Cooke sold the Forum, Kings and Lakers in 1979 to Dr. Jerry Buss. In 1967, Cooke was a founder of the United Soccer Association and owned the Los Angeles Wolves team, which became a charter NASL team the following year. In 1971, he was financial backer of the first Muhammad Ali vs Joe Frazier boxing match, held at Madison Square Garden and won by Frazier. A lover of horses and a fan of Thoroughbred horse racing, Cooke owned Kent Farms, a 640-acre (2.6 km2) estate in Middleburg, Virginia, not far from Washington, D.C. In December 1984 he purchased the historic Elmendorf Farm in Lexington, Kentucky from the estate of Maxwell Gluck. He bred and raced a number of successful horses, notably Flying Continental whose wins included the 1990 Jockey Club Gold Cup. Cooke's marital history became progressively more colorful as he got older. He was married five times; however, two of the five marriages were to the same woman: Marlene Ramallo Chalmers. He was married to Chalmers at the time of his death. Cooke and his wife Jean in 1955. Cooke's first marriage, his longest, lasted 45 years. He and Barbara Jean Carnegie married in 1934, and were divorced in 1979. In the divorce action, Carnegie was awarded what was then the largest divorce settlement in history — $42 million. The presiding judge during the bench trial was Joseph Wapner, who later became famous as the judge on television's The People's Court. Cooke and Carnegie had two sons: John Kent Cooke and Ralph Kent Cooke. Cooke's second marriage, to Jeanne Maxwell, lasted only 10 months. Cooke's third marriage, to Suzanne Elizabeth Martin, 43 years his junior, was even shorter: 73 days. During that brief marriage Martin, age 31, gave birth to a baby girl who the couple named Jacqueline Kent Cooke. In her divorce action, Martin sought $15 million from Cooke. Following Cooke's death, it was revealed that his final wife, Marlene Ramallo Chalmers—beautiful Bolivia woman who was 40 years his junior—had been cut out of his will. Cooke and Marlena had married in 1990, divorced in 1993 (after she made headlines in September 1993 by driving drunk in the Georgetown section of Washington DC with a man pounding on the hood of her Jaguar convertible), and remarried in 1995. Marlena filed a lawsuit against Cooke's estate and reportedly received $20 million in a settlement reached about a year after Cooke's death. The bulk of Cooke's $825 million estate went into establishing the Jack Kent Cooke Foundation to help selected students of modest means attend college. The stated mission of the foundation is to "help young people of exceptional promise reach their full potential through education." Cooke's will, which revealed his multiple changes of heart regarding his wives and children, received considerable public attention at the time of his death. ↑ "Washington Post: Jack Kent Cooke Life Chronology". The Washington Post. February 2, 1998. Retrieved January 14, 2008. ↑ "Jack Kent Cooke's Will: Index Page" 1997, Washington Post. Accessed February 9, 2007.